A secured credit card is just like a regular credit card in the way that it is used. The main difference is that in order to obtain a secured credit card, you must deposit money up front with the bank that issues the card. This refundable deposit is held by the bank in an FDIC insured account as collateral to cover any credit card balance you may owe the bank when you make charges on the credit card. The amount of the money you are required to deposit varies but is typically equal to the amount of your desired credit limit. For example, if you want a secured credit card with a $500 credit limit, the bank that issues the card will require a $500 deposit. You may make this deposit in a variety of ways – by writing a check and mailing it to the bank, by ACH transfer, or in some cases walking into a branch. Once the bank receives your deposit, the bank issues the secured credit card. A secured credit card works very much like a regular credit card. In fact, it is identical when it comes to paying for things you buy at a store or buy online, paying bills and most other charges. Merchants, stores, restaurants, online retailers and anyone accepting your card cannot tell the difference between secured cards and regular cards. Secured cards look and behave just like regular credit cards. The main difference between a secured credit card and a regular credit card is that you must deposit money with the bank that issues the card. This deposit is held by the bank as collateral for the charges that you make on the card. As long as you pay the amounts that you owe your deposit will be refunded when you close your account. If, however, you do not pay the amounts that you owe, the bank will deduct any amounts you owe from the deposit before refunding the remaining amount to you. Where is my security deposit held? Your security deposit will be held in an account at the bank. These accounts are almost always FDIC insured and in some instances even earn interest. You will not have access to your deposit until you close you cancel you secured credit card account and pay off any remaining card balances. What happens to my security deposit when I close my account? Your security deposit will be refunded to you when you close your account. The bank will deduct any amounts that you owe the bank at the time you close your account. If you owe the bank an amount that is greater than or equal to your security deposit, the bank will keep your entire security deposit. Can I get a secured credit card with bad credit, poor credit, or no credit history? Yes, secured credit cards are designed for people with bad credit. Banks are primarily concerned with getting repaid for the amounts that the cardholder owes to the bank. With a regular credit card, the bank takes a risk that you will not pay them. With a secured credit card, the bank has much less risk because there is a cash deposit they can draw on in the event you don’t pay. For this reason, banks are willing to issue secured credit cards to people who would not qualify for a regular credit card. What are the advantages and disadvantages of a secured credit card compared to a regular credit card? What are the advantages and disadvantages of a secured credit card compared to a prepaid card? Does a secured credit card improve my credit history? Yes, if used responsibly. Your secured credit card activity is reported to the three major credit reporting agencies – Experian, Equifax, and TranUnion — just like a regular credit card; however, just like a regular credit card, if you fail to pay amounts owed on time, it may damage rather than help your credit rating. Is a secured credit card a good option for me? have the funds to make the initial deposit. 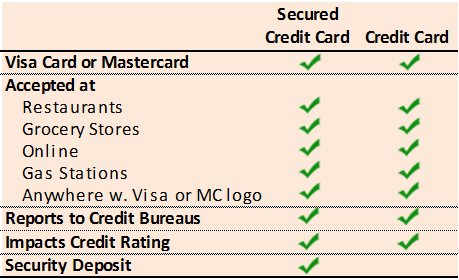 If I get a secured credit card, will I be able to obtain a regular credit card in the future? Yes, if you get a secured card and use the card responsibly so that your credit score increases through use of the card, you may be offered the ability to move to an unsecured credit card or you may be able to apply for and obtain an unsecured credit card in the future. To compare secured cards visit see our Secured Card Calculator.